Did you know that the heart beats over 100,000 beats per day! An average heart beats between 60-100 beats per minute. Advances in emergency medical technology have made it so that it is possible for laypeople to administer emergency care. While this doesn't eliminate the need to go to the emergency room, early response increases the chances of survival while minimizing permanent damage to the patient. The Automated External Defibrillator (AED) is a relatively new machine that helps people who are having heart attacks by restoring their normal heart rhythm. The AED is the portable machine that shocks the heart back into its normal rhythm. The AED is designed for use in ambulances, offices and the home. Pads are placed on the patient and the machine diagnoses when a shock is needed and then administers the shock. The heart pumps blood through the body using a series of timed electrical signals that contract the chambers and push blood through the heart and out of it. These contractions cause the heart to beat. It's important that these currents are paced well against each other so that the heart functions properly and the blood moves smoothly through the body. Occasionally, however, something happens to create an irregularity in the heartbeat. The function of the AED is to send an electrical current through the heart, which essentially "resets" the heart. Ideally, the shock enables the regular heartbeat. Early response to a person undergoing cardiac arrest is essential to his survival. According to the American Heart Association, "If a normal heart rhythm isn't restored in minutes, the person will die. In fact, for every minute without defibrillation, the odds of survival drop 7 to 10 percent. A sudden cardiac arrest victim who isn't defibrillated within 8 to 10 minutes has virtually no chance of survival." For this reason, first responders, from laymen to professionals, are now required to defibrillate as early as possible if the machine is available. The AED is found in many public places and in people's homes. 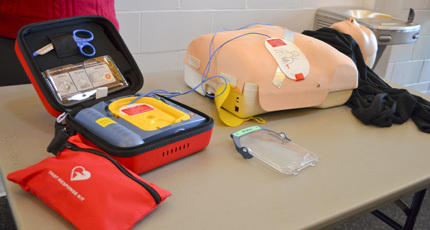 You are not required to have extensive emergency medical training to use the AED, though it is recommended that you have some sort of training in order to be able to use it under high-pressure situations.